Does it seem a bit early to be harvesting garlic? 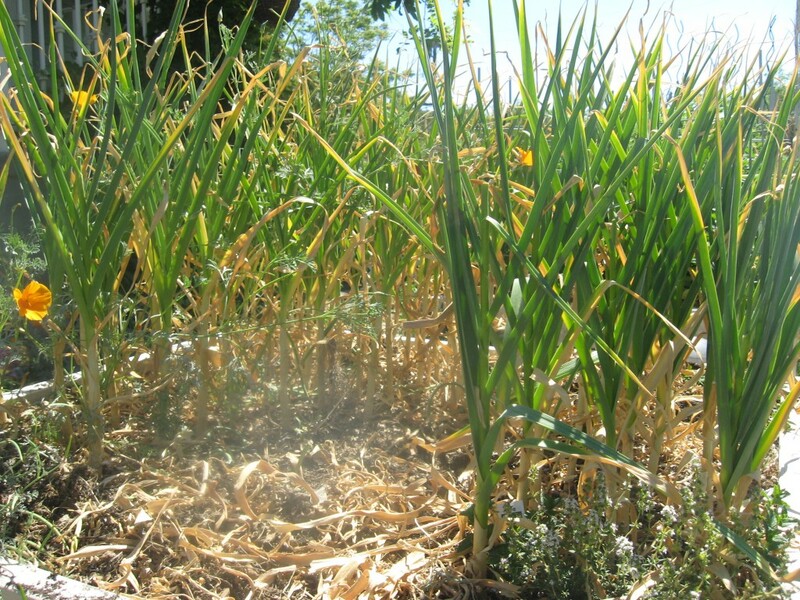 After a mild Winter that ended early, this Spring allowed the garlic to start sending up scapes probably 6 weeks ago, leaves began turning yellow on top and dying back from the bottom – all signs that the garlic may be ready for harvest. I’ve been testing a bulb here and there for the past few weeks, and decided the time was right. Today is also a root day on the biodynamic calendar, which is an excellent choice for harvesting root crops. The concept of biodynamics is still very new to me, but I’m excited to be adding my new-found knowledge to the garden. 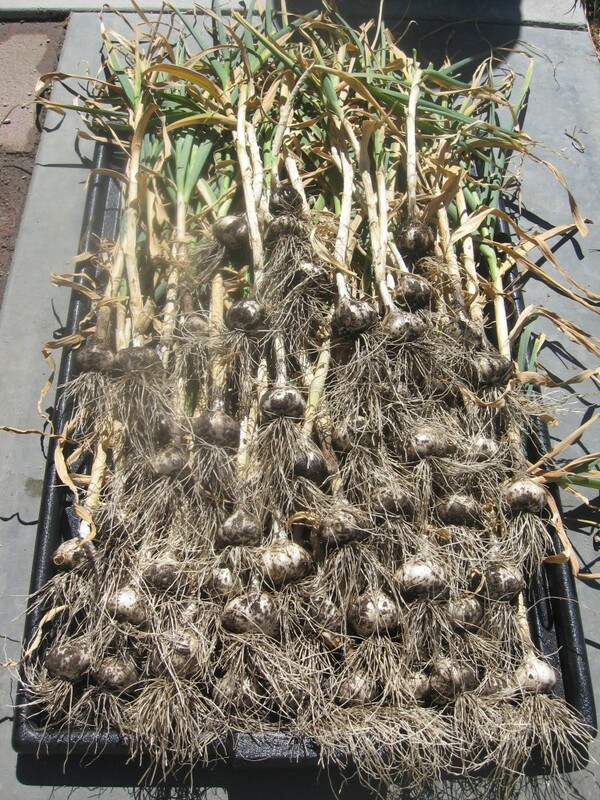 After starting today’s harvest, I decided to leave half of the garlic in the ground, as some bulbs could use more time to develop. The remaining bulbs will be carefully harvested one-by-one, as they are ready. The magic solution seems to be to harvest when they have only 2, 3 or 4 green leaves. More leaves than that, and the bulb is underdeveloped. Less than that, and the protective coating has begun to deteriorate, making them less likely to store well. I made the mistake of leaving the garlic in the ground too long last year, and suffered from a poor crop. Many of the bulbs had lost most (if not all) of their protective paper covering, and were sent immediately to the food processor to make garlic paste. The Spanish Roja and Music are new in my garden this year. I purchased the seed garlic from Grow Organic, since I didn’t have enough good quality garlic left over from last year. The Inchelium Red and Persian Star were salvaged from the bulbs I’d been growing, originally purchased at Botanical Interests in 2012. My only challenge is that I have no idea who’s who! If anyone knows a great way to tell them apart, please leave me a comment. This process will start again this Fall – I’ll plant the cloves from the leftover garlic I haven’t eaten yet. (Actually, I’ll save the very best bulb of each, and plant those cloves.) With this year’s great crop, I’ll have more than enough! No vampires in these parts!